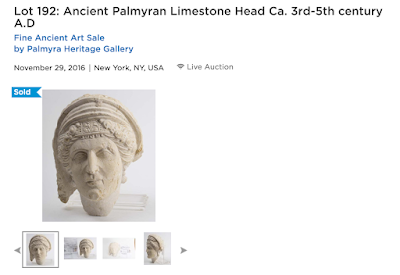 Auction Alert I: Ancient Palmyran Limestone Head Ca. 3rd-5th century A.D.? 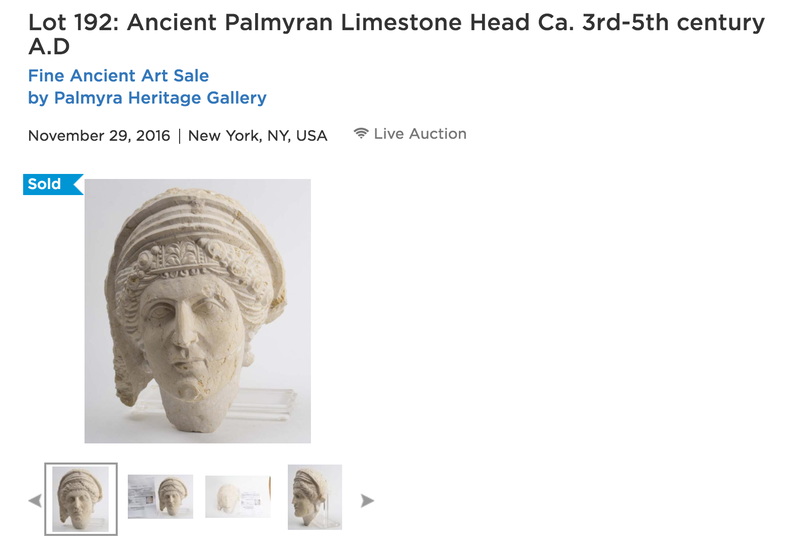 Two different online auction websites, Live Auctioneers and Invaluable each have "sold" a listing for the same Palmyrene limestone funerary bust. The object on offer was sold November 29th through Palmyra Heritage Gallery in New York City with a closing bid of USD $3,900. As detailed in that earlier ARCA blog post, involving another potentially suspect object, Khouli moved to New York City with his family from Syria in 1992. Once in America he opened a gallery specializing in objects from the ancient world in 1995. His father had a gallery in Damascus, Syria for 35 years and his grandfather too worked in the art and antiquities trade, meaning that he should likely be well-versed in the legalities of trading in objects from the ancient world. But knowing the law and abiding by the law, are two different things. Cultural Property Attorney Rick St. Hilaire, who followed the court case against Khouli and other defendants throughout the federal proceedings, reported in April 2012 that the antiquities dealer/numismatist pled guilty to smuggling Egyptian cultural property into the United States and to making a false statement to law enforcement authorities. In November of the same year United States Senior District Judge Edward R. Korman departed from the federal sentencing guidelines and sentenced Khouli to a relatively light sentence for his misdeeds: six months home confinement, one-year probation, 200 hours of community service, and a criminal monetary assessment of $200. Yet looking at the documentation for Khouli's recent auction of the Palmyrene limestone funerary sculpture also raises some questions. At the time of the 2008-09 conviction Khouli provided the purchasing collector with false provenance for the trafficked Egyptian antiquities; documents which stated that the objects were part of a private collection that his father had assembled in Israel in the 1960s. 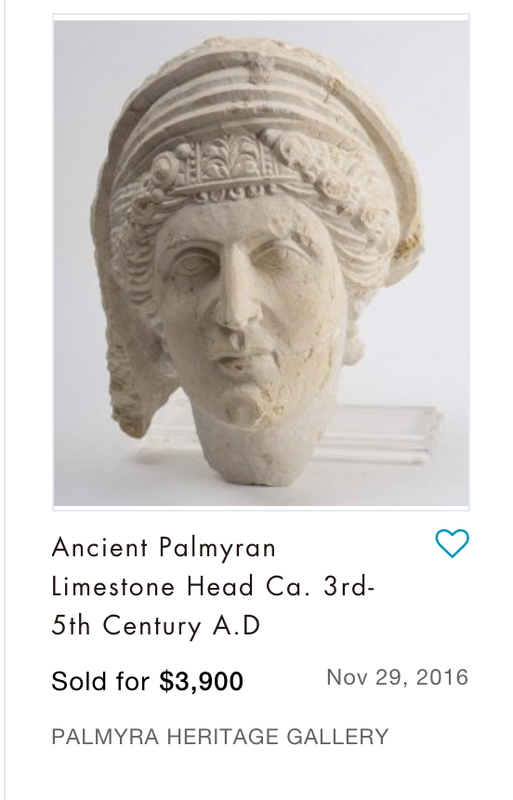 Under the listing for the Palmyrene limestone funerary bust both websites list: "Private NYC Collection acquired From Israel 10-03-2011 with original Export License from Israel" for the object's provenance. Along with the written detail, each auction included a reassuring photo for the would-be bidder, a rumpled document written in Hebrew and English that states that the object had been exported from Israel through Sami Taha, an antiquarian and numismatist whose website states he is "serving Jerusalem and the world's market for antiquities from the Holy Land by authority of the Israel Antiquities Authority." The physical location for his shop has since closed though he is still selling actively on the web. * Note: No copy of this dealer's Israeli Antiquities Authority license has been provided on Taha's website. 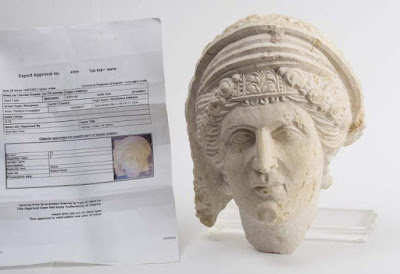 If the provenance document provided during the sale for this limestone funerary bust is to be believed, the object was shipped from Israel to a collector in Europe. Interestingly the name listed as the importer, also shows up on other antiquities traceable to Khouli as the collector listed in the provenance of at least three objects being sold or which have sold through various online auction websites, making these objects equally questionable. But what does an Israeli export authorization form actually look like? 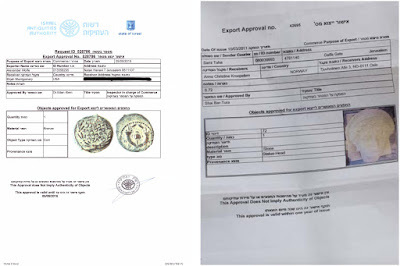 Below is an example of an authentic Israeli-issued IAA export approval document issued in 2011 (below left). The document next to it is the one provided by Khouli for the Palmyra bust (below right). 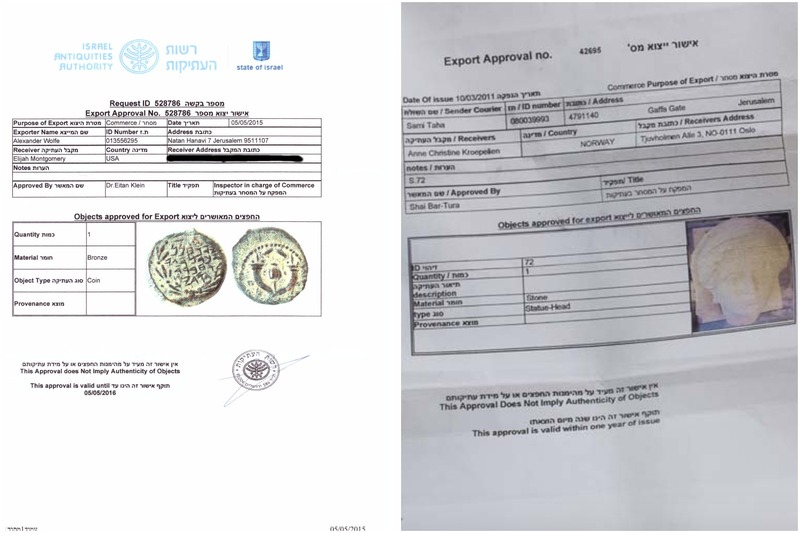 Notice that the documentation provided for the purported Syrian object does not identify the export authority in the header, nor is it rubber-stamped or signed. But why didn't the limestone funerary bust, allegedly from Palmyra, have any documentation from its country of origin, Syria? Article 69 of the Syrian Antiquities Law specifically provides that an export license may only be granted with regard to antiquities that are to be exchanged with museums and other scientific institutions, and with regard to antiquities given to an organization or mission after excavations are finished. Neither of these circumstances appear to be the case with the auctioned funerary bust, making the fact that the object has no other substantiating paperwork, prior to 1963, all the more suspicious. So if the object is authentic, then who moved the bust from Syria to New York, and how and is it authentic? ArchaeologyIN (The Archaeology Information Network) has notified Walid Al-Asad, the former director of antiquities and museums in Palmyra on 28 November about the object's upcoming sale and Al-Asad stated that at first glance the auction photo appears to meet the artistic specifications of a Palmyrene limestone funerary bust. On this basis, ArchaeologyIN formally notified Dr. Maamoun Abdulkarim, Director General, Directorate General of Antiquities & Museums (DGAM) in Syria of the potentially suspicious item. Questioning its entry into the United States on the basis of the material supplied by the seller, ARCA in turn contacted U.S. Immigration and Customs Enforcement (ICE) in New York about its concerns regarding the object's limited import/export paperwork and the bust's purported export provenance from Israel via possibly Oslo. But small organizations and understaffed source countries, acting alone or in cooperation, cannot tackle all of the triangulations between looters, smugglers, dealers and potential buyers. Without the active support of the art collecting community itself, the problem of illicit trafficking will always be a catch me if you can game of cat and mouse. The appearance of paperwork, should never replace a buyer's own due diligence. If crafty antiquities dealers can write anything they want about an object's collecting history when promoting their wares for an auction listing then it's ultimately up to the individual collector/buyer to do their own homework before ethically committing to the purchase ancient art. 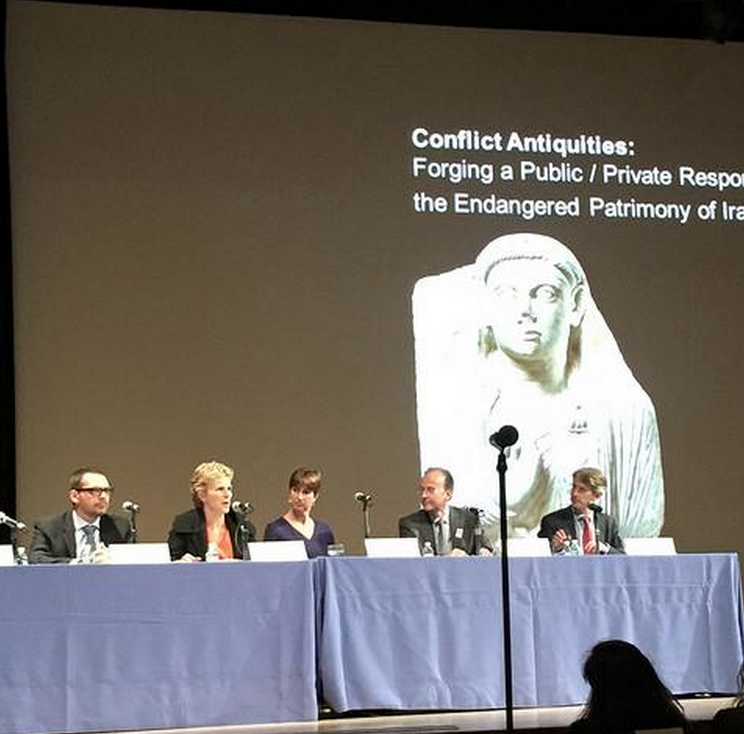 This is all the more true of antiquities whose purported origins are from conflict-ridden war zones such as Palmyra. The antiquities dealer says he has an export license? Do you, as the potential buyer, know what type of actual import and export documentation an ancient object would need to have to have legally passed out of the object's source country and into the hands of the seller in the dealer's destination country? Do you as a collector know enough about the heritage protection laws in the country where the object originates to make sure what you are purchasing isn't contributing to a country's instability? As a morally principled art buyer, who are you are entrusting your purchase to? Do you know the background and ethics of the antiquities dealer you are purchasing an object from? Has that person been involved in dishonest trading in the past? Have they falsified documentation previously in furtherance of laundering illicit objects through the licit market either for greed or to satisfy collector's demands? As a buyer, investing in ancient art, the antiquities collector has the right, but also the responsibility, to ask to see all export documentation and to verify that the object's provenance claims are true, before any money changes hands. Ethical antiquities dealer with a clean object should have no problem with the close scrutiny. If they do, or if the deal seems too good to be true, then it most likely is. For more information on this particular dealer's past history ARCA recommends the following Dr. David Gill's Looting Matters posts as well as the comprehensive federal case reporting of Rick St. Hilaire which can be found here. 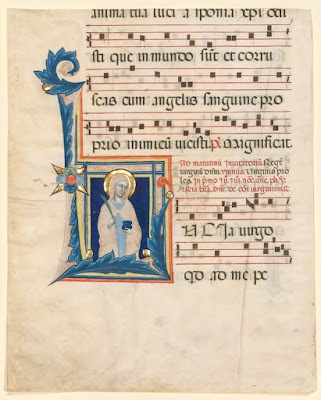 After reviewing photographic documentation provided by Italian authorities, the Cleveland Museum of Art has voluntarily transferred a 14th-century manuscript folio (leaf) from an Italian Antiphonary to the U.S. Immigration and Customs Enforcement’s (ICE) Homeland Security Investigations (HSI) division for its eventual return to Tuscany. An antiphonary is a book intended for use by a liturgical choir. This particular looted page was sliced out of a seven-page songbook that originally belonged to the Church of Saints Ippolito and Biagio of Castelfiorentino. Its sister pages are preserved at the Museum of Santa Verdiana south west of Florence. The page is believed to have been removed from the antiphonary sometime between 1933 and 1952 when the work was purchased by the museum. The antifonary, measures 44.3 x 35.2 cm and is believed to have been created by an artist known as the Master of Dominican Effigies, an important illuminator whose exact name, until now, is unknown. The illuminated parchment hymnal was produced sometime between 1335 and 1345. The foglio page being returned has illustrations in ink and tempera and is embellished with gold leafing. According to the Cleveland Museum of Art, the foglio was attributed to another illustrator at the time of its purchase. Curators at the museum became suspicious when a second attributable page from the same antiphonary came up for sale on the Swiss art market. US and Italian law enforcement authorities were notified and an investigation was initiated which has led to this eventual return. Collecting single leaves from Medieval and Renaissance illuminated manuscripts while quite in vogue, are activities collectors should approach with a lot of caution and healthy doses of due diligence. While there has been a historic tradition of biblioclasts, or book breakers — someone who breaks up books and manuscripts for the illustrations or illuminations, there are also way too many instances of more recent thefts commited by individuals with access to little used historic texts who have helped themselves to more than a page or two, creating collection histories to cover their tracks. Pier Luigi Cimma and Franca Gatto, two professors who participated in a 1990 inventory of Italian church archives were known to have cut pages from several manuscripts, most of which they sold to a bookseller in Turin, Italy. Thanks to the city of Monza's squad from the Nucleo dei Carabinieri Tutela Patrimonio Culturale, several of these were recovered from Sotheby’s in London. A delivery date for the return of the Cleveland Museum foglio to the Italian government is being finalized. 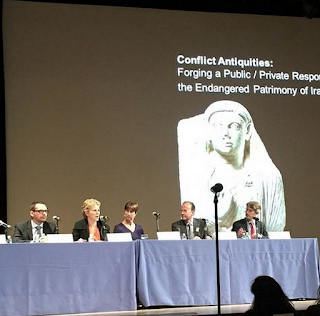 In an awareness raising initiative to highlight the ongoing upheaval and destruction of cultural heritage in Iraq and Syria, the Metropolitan Museum and the US State Department jointly held an event yesterday titled, “Conflict Antiquities: Forging a Public/Private Response to Save Iraq and Syria's Endangered Cultural Heritage” in New York City. 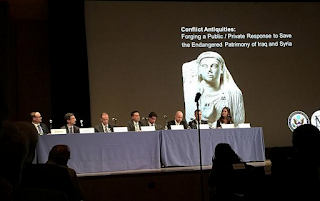 Deputy Secretary of State Antony Blinken highlighted one example of a looted and not destroyed antiquity that is known to have passed through the hands of ISIS operatives. The object, a 9th century B.C.E: ivory plaque, decorated with a procession of Assyrian officials and foreign tributaries was excavated at the ancient Assyrian capital of Nimrud by a team from the British Museum in 1989. The plaque was recovered by U.S. special operations forces during a tactical raid that killed a key ISIS commander, identified by his nom de guerre Abu Sayyaf, last May in al-Omar in eastern Syria. This ancient object is known to have been looted from the Mosul Museum (Iraq) and underscores what many following illicit antiquities trafficking have already concluded, that the Islamic State not only destroys objects it find religiously offensive or useful for its public propaganda but also has been known to plunder antiquities for some level of financial gain or as war booty when opportunity knocks. 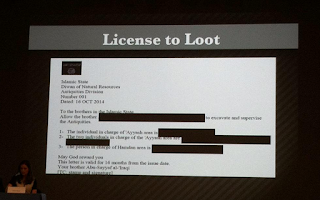 Deputy Assistant Secretary of State Andrew Keller added that "newly declassified evidence" seized when American Delta Force commandos took out Abu Sayyaf and twelve other Islamic State of Iraq and Syria fighters included receipts collecting taxes from looters as well as written edicts that threatened punishment for those caught looting antiquities without formal Islamic State permission. While some of this information appears to be newly declassified, conflict antiquities archaeologist Dr. Sam Hardy released a lengthy analysis of the heritage hoard seized during the Abu Sayyaf raid when details of the cache were released by the State Department in July 2015. That analysis has been available for two months and can be reviewed here. "offer a reward of up to $5 million for information leading to the significant disruption of the sale and/or trade of oil and antiquities by, for, on behalf of, or to benefit the terrorist group Islamic State of Iraq and the Levant (ISIL), also known by its Arabic acronym as DAESH." Hartuung emphasized that the Rewards for Justice incentive is not a buyback program, but reward for help in identifying and catching smugglers linked to ISIS. 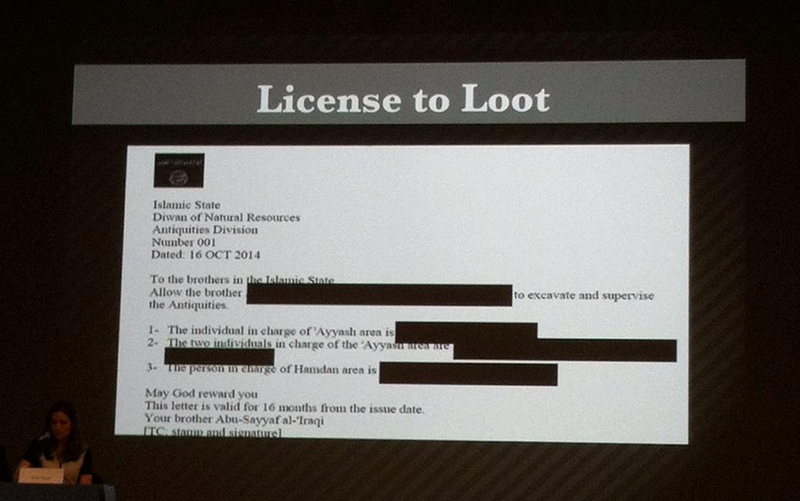 At present this reward appears to be restricted solely to the Islamic State and does not appear to be not available for information leading to the disruption of the sale of illicit antiquities by other armed groups or other non political traffickers profiting from the absence of controls during the ongoing war. 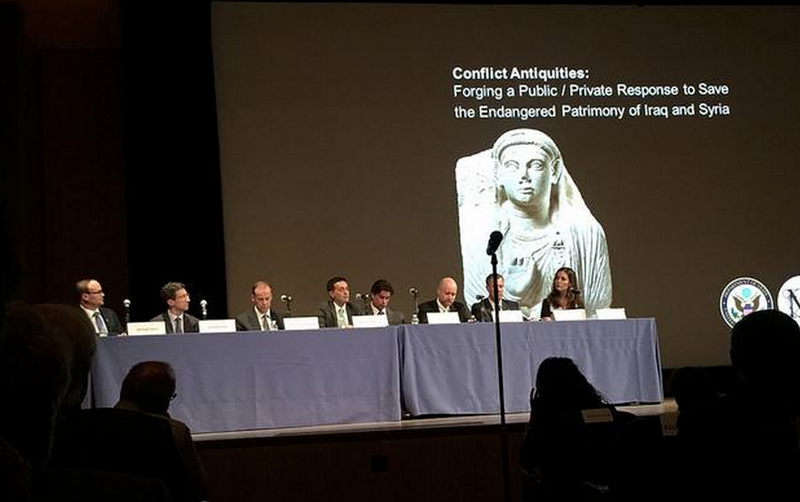 Another panel discussion highlighted the work of the US government-sponsored organisation currently tasked with ground-based observations of cultural heritage incidents in Syria and Iraq. Michael Danti, from the American Schools of Oriental Research (ASOR), who’s group has just been allocated a second tranche of federal funding totalling $900,000 in an extension to their previous $600,000 one-year cooperative agreement with the U.S. Department of State spoke on his organization's work continues to document the current condition of cultural heritage sites in Syria and portions of Iraq. While useful in its own right, ASOR's federally-funded initiative often draws upon the research and analysis of other conflict antiquities researchers, some of whom consistently work below the funding radar, within this sector of expertise on a voluntary basis and without the benefit of funding from governmental or academic bodies. Wolfgang Weber, ‎Head of Global Regulatory Policy at eBay, spoke about the due diligence of the web-based auction powerhouse that handles 800 million online auctions a year. Sales of illicit objects online are a known and ongoing problem where illicit antiquities are concerned and attempts to prevent such illegal activity via large auction sites such as eBay are a work in progress. Judging from their ability to monitor other areas of illicit activity, many believe that eBay's efforts in policing their online marketplace have largely been ineffective or fallen short of desirable outcomes. Weber's presence on the panel underscores that the internet is being harnessed to provide valuable tools for traffickers, who exploit weaknesses in online marketplaces, making the illicit trafficking of cultural property faster, easier and ever more difficult for authorities to fight. During his presentation Weber stated that his team's task is to identify illegal items & remove them from the online marketplace but he added that eBay does not have the capacity to check individual items, only their sales conduit. This means that the auction site's contribution to stopping illegal sales is limited to preventing sellers from listing items of concern or in some cases removing listings before a sale can be made. eBay relies heavily on key word searches and external reports by individuals who inform the company when an object has been identified which is of dubious origin or legality. Private citizens and researchers connected to small NGOs are hampered from stopping the online trafficking of items as they can only flag up what’s known to be illegal or looks that way to eBay. Those monitoring the online auction site cannot procure hard evidence by buying the actual contraband as they would then be in violation of national and international laws and treaties themselves. "Operation Mummy’s Curse,” a five-year investigation carried out by ICE’s Homeland Security Investigations (HSI) that targeting an international criminal network that illegally smuggled and imported more than 7,000 cultural items from around the world and resulted in at least two convictions. Sharon Cott, Senior Vice President, Secretary & General Counsel at the Metropolitan Museum, spoke in support of AAMD member museums who apply ethical principles to safeguard against purchasing blood antiquities and to the roll of museums should play as safe havens for objects during times of unrest. Dr. Markus Hilgert, a professor of ancient Near-Eastern studies and Director of the Vorderasiatisches Museum im Pergamonmuseum - Staatliche Museen zu Berlin spoke about his newly funded trans-disciplinary research project on the illicit trade, ILLICID, with partners in customs and law enforcement, the German Federal Foreign Office, Federal Commissioner for Culture and Media, German Commission for UNESCO and ICOM. The ILLICID project is financed via the German Federal Ministry for Education. Hilgert stressed the need to identify and develop criminological methods for in-depth analysis of illicit trafficking, stressing the need for more information on object types, turnover, networks, and various modus operandi. 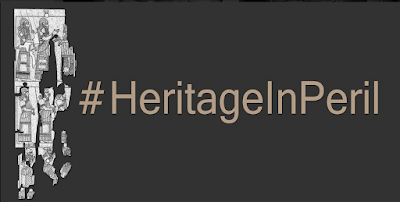 He further underscored the need to adequately assess the various dimensions of money laundering and terrorist financing that may be being derived from heritage trafficking. In conclusion he emphasized that trafficking is the number one threat to the world's cultural patrimony - more than destruction. ARCA would like to thank all those who were present in the room and who live-tweeted the conference and took detailed notes allowing those of us in Europe to listen in, even if it was way past our bedtimes. There was a lot of ground covered and more still that needs to be covered. On July 12th, I attended a cultural repatriation ceremony at the Embassy of Peru in Washington, DC. The ceremony was conducted in order for U.S. Immigration and Customs Enforcement (ICE) to formally return to the government of Peru 14 stolen and looted cultural paintings and artifact. The items were recovered in 5 separate investigations by special agents of ICE Homeland Security Investigations (HSI). 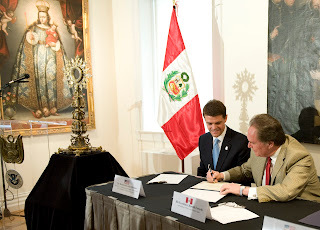 Returned to the people of Peru were 9 beautiful 18th century religious paintings from the Cusco region of Peru, a Spanish colonial silver and gilt enamel monstrance from the 1700’s that was stolen from a church altar, and 4 archeological items that date back more than 2,000 years. The return of these items was the culmination of a year’s long investigative effort by ICE special agents, the U.S. Attorney’s Office, Interpol, and the State Department’s Cultural Heritage Center. Participating in the repatriation ceremony were ICE Director John Morton, Peruvian Ambassador to the United States Harold Forsyth, and U.S. Department of Justice Deputy Attorney General James Cole. “This repatriation is an example of what can be accomplished when law enforcement partners and government leaders from around the world work together in pursuit of a common goal” said Deputy Attorney General James Cole. Because of the proactive and thorough investigative and undercover work by special agents, these items were able to be returned to their country of origin. Several were up for auction at a Christies, some were being sold at numerous galleries, and still others were offered for sale on EBay. HSI investigations revealed that all of these objects were taken out of Peru in violation of Peruvian law and brought into the U.S. in violation of U.S. Customs law and regulations. Specifically, the items had been removed in violation of a U.S.--Peru bi-lateral agreement negotiated by the U.S. Department of State and enacted in 1997, which restricts the importation of pre-Columbian artifacts and colonial-era religious objects into the United States without proper documentation. Federal importation laws give HSI the authority to take a leading role in investigating crimes involving the illicit importation and distribution of cultural property and art. Customs laws allow HSI to seize cultural property and art brought into the United States illegally, especially when objects have been reported lost or stolen.